Calm and easy going, Mr. 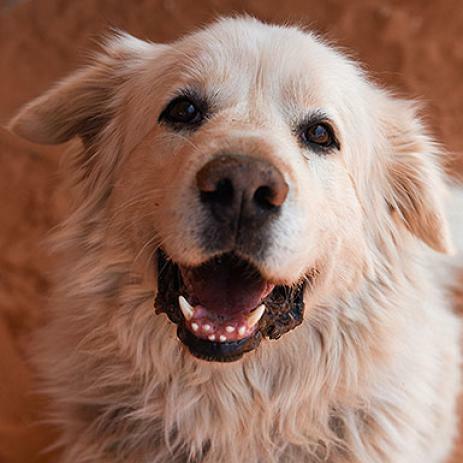 Buddy is always happy to see people he knows, and he'll greet you with his giant tail wagging in big circles. He seems to bond with people very quickly and then he wants to spend time with them, even if that means just lying around next to someone in a comfy spot. At the Sanctuary, Mr. Buddy seems confident in most situations. He jumps into cars without hesitation and rides very well. Mr. Buddy was born in 2012 and showed some guarding behaviors in a previous home. Because of this, Mr. Buddy would likely do best in an adult-only home. He's currently living as a single dog at Dogtown, and this is what seems to make him happiest. Mr. Buddy is currently working on greeting a a variety of new people. He currently is available for outings and sleepovers!